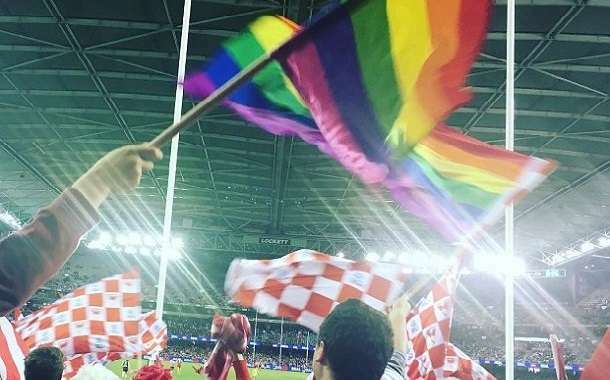 A Russian football official has insisted that gay fans will not face arrest for waving rainbow flags at next year’s FIFA World Cup, despite the country’s homophobic “gay propaganda” law. FIFA’s anti-discrimination group FARE last week warned that gay spectators at the 2018 event holding hands or waving rainbow flags could face an aggressive response from intolerant locals. “The same message is there for black and ethnic minority fans – do go to the World Cup but be cautious,” Powar said. Russia’s anti-gay laws outlaw “propaganda of non-traditional sexual relationships” towards children under the age of 18. But activists say the laws have been used to broadly restrict any public display of homosexuality or support for LGBTI rights. Russian Football Union official Alexei Smertin told The Guardian there will “definitely be no ban on wearing rainbow symbols in Russia” during the World Cup in June and July next year. “It’s clear you can come here and not be fined for expressing feelings,” he said. Mr Powar said he welcomed Smertin’s reassurance. “He’s giving some reassurances and I think in the end that’s all that people want,” he said. Russia’s “gay propaganda” law was condemned by the European Court of Human Rights in June in a ruling that said it was fuelling homophobia in the country. Recent independent research found that anti-gay hate crimes had doubled in Russia since the passing of the law in 2013.